To finish seeing everything we wanted to see in Oslo meant today would be a busy day. We breakfasted in the hotel, then took the subway to the Munch museum. We got there at 9:30. We thought it opened at 10. We were wrong, it didn’t open until 11. Waiting made no sense, so we got back on the subway to return to center city. This time we got on a ferry near City Hall to visit the Viking Ship Museum and the Norway Folk Museum. The Viking ships were first; one well preserved ship and 2 in not as good shape. 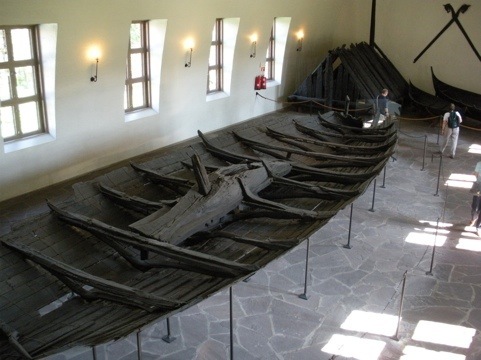 The ships were used for burial after their useful life, and found over the years in Norway. We then walked to the folk museum, which captures how Norwegians have lived over the years. 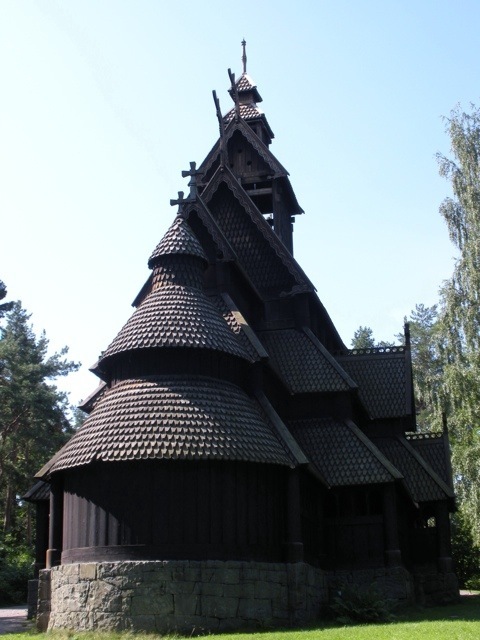 The highlight was a stave church, built in the 1200’s and moved to the museum. Beautiful on the outside, with carved wood paintings on the inside. Next we took a bus back to city center. We hopped back on the subway to return to the Munch museum. At least we knew the way! The security was tighter here than anyplace we have been, but that is owing to the art theft that took place here several years back, when a copy of Scream and Madonna were taken. Munch’s paintings were organized in chronological order, which was helpful since he painted what was going on in his life at the time. We came back to the hotel briefly, then went to dinner near the water at an Italian restaurant called Olivias. We shared a pizza, walked along the water, then got some tasty soft serve ice cream. We pack up tonight, rent a car in the morning, then make our way west toward the fjords. The big city portion of our Norway vacation is over. This entry was posted on Sunday, July 31st, 2011 at 8:13 pm	and tagged with Munch, Norway, Oslo, Vacation and posted in Oslo. You can follow any responses to this entry through the RSS 2.0 feed. So just a copy of the Scream was stolen? Not the original? 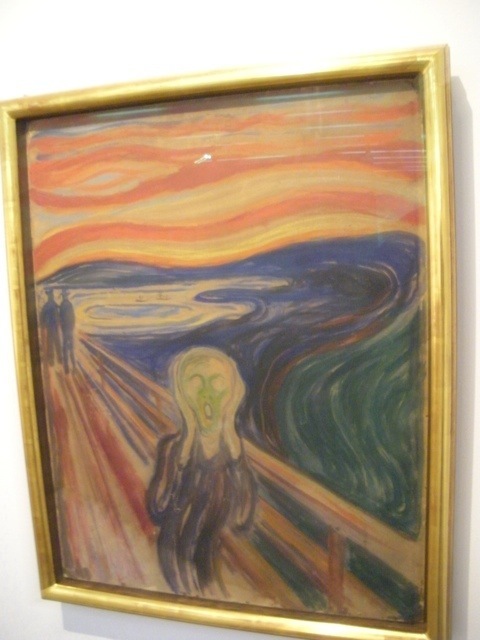 There are 4 original paintings of The Scream. One was stolen.